Super moisturizing hand cream. Hand cream "youthful skin." Doing away with hand cream in modern conditions is not easy. Every day the skin is exposed to negative effects. Our handmade cream has a positive effect on the structure of the skin, will increase elasticity, elasticity and reduce peeling. 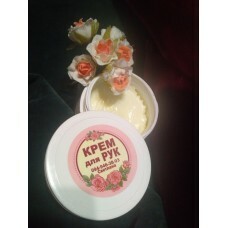 After regular application of our cream, the skin will become soft and silky. The most natural and environmentally friendly cosmetics handmade only with us. A woman is vital for breathing skin throughout the day !!! Almond oil Almond oil has softening properties. When almond oil is used directly on the face, it helps to improve the complexion and tone of the skin, giving it a healthy glow. Also, oil is widely used to lighten the skin, and regular use cleanses the skin, making it soft and supple. Aloe vera gel Aloe vera gel is a universal and effective skin care product. What are the following properties of the gel in the field of cosmetology: It narrows the pores, removes greasy shine, helping to restore the epidermis to the owners of fatty skin type. Slows down the aging process of the skin, rejuvenating it. Moisturizes the stratum corneum, exfoliating the dead cells. Helps to cope with acne. Has excellent regenerating abilities, accelerating the healing of light cuts and wounds. Soothes the skin after a sunburn or chemical pilling. Eliminates skin diseases such as eczema, acne, seborrhea, dermatitis. Prevents the appearance of acne. It gives the skin tone, moisturizes dehydrated and dry skin. Protects the skin from infections, reduces itching after a mosquito bite. Emulsifier Emulsifier is a substance that combines oil and water into a homogeneous cream. Glycerol Glycerin has antiseptic properties. Moisturizes and retains the moisture of the skin. Grape seed oil Grape seed oil-regulates grease glands, has an antioxidant effect, tones, reduces pores and rejuvenates. Jojoba oil The composition of jojoba oil includes amino acids, which in their structure most closely resemble collagen, that is, the substance that is responsible for the elasticity of the skin. Lavender hydrolyte Lavender hydrolyte is a universal remedy for all skin types. Lavender is known for its properties to regenerate the skin after damage, has a cooling, soothing and refreshing effect. Lavender water helps fight the manifestations of skin aging, helps to prevent the appearance of stretch marks. Macadamia oil Macadamia nut oil is called a noble oil. It is instantly absorbed, eliminates irritation, peeling, restores softness and tenderness of the skin. This is an amazing and, as it is called, "magic" oil heals wounds and heals burns, restores youth and beauty to the skin. Cosmetics with macadamia oil, as a rule, are very expensive. Shea Boil Shea oil - stimulates blood circulation, deeply penetrates and nourishes each, contains vitamins A, E, F, well helps with couperose. Vanilla essential oil Vanilla is one of the softest on the influence of oils, gently affecting the epidermis, with constant application it actively improves the characteristics of the skin, increasing its softness, velvety and elasticity. This oil is not quite suitable for fast-acting agents, but with daily use, the effect of its application is visible even after a short time. Wheat germ oil Oil of wheat germs - significantly improves skin color, rejuvenates, gives elasticity to the skin, fights acne and stretch marks.